Welcome to Christine Middleton Online! 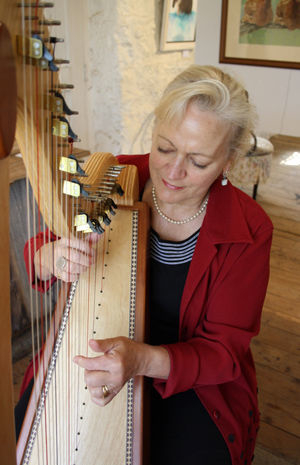 Christine Middleton is a Certified Therapeutic Harpist and a lover of all things Harp. She recently launched her new business "Healing Harp" to promote the healing qualities of the harp for wellbeing and health. Click on "HEALING HARP" and "SHOP" for more information. Christine is also an Award Winning Playwright, Musician, Storyteller, Performer and Writer of Life Story Musical Theatre Productions that document real historical journeys of ordinary people living lives of adventure, joy, heartache and endeavour. Accompanying herself on the Celtic Harp, Christine sings and tells stories of love, journey, hope, adventure and survival. Click on "THEATRE PRODUCTIONS" for more information. Born and raised in NE Victoria, Christine has lived in the city, by the Sea and on a farm in rural remote NSW. She draws her inspiration from the places she has lived and the people she has met.